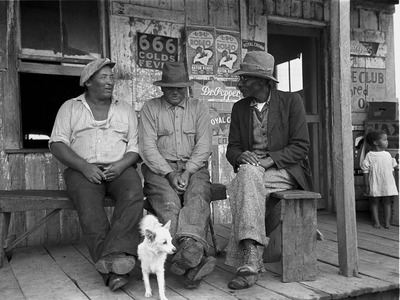 Wikimedia CommonsA photo from the federal government’s campaign to document the Great Depression. Coming out of the depth of the Great Depression, the late 1930s ushered in a time when the US seemed to be back on stable footing. Well it should, said the Morgan Stanley global strategy team of Chetan Ahya, Elga Bartsch, and Jonathan Ashworth. In fact, the team said in a note to clients Wednesday that nearly the exact same situation that occurred in 1937-1938 is currently happening in the US. “The critical similarity between the 1930s and the 2008 cycle is that the financial shock and the relatively high levels of indebtedness changed the risk attitudes of the private sector and triggered them to repair their balance sheets,” wrote Ahya, Bartsch, and Ashworth. Disastrously, in fact, as the private investment couldn’t replace public investment, inflation expectations plummeted and deflation rocked the economy into a double dip recession. Unemployment rose again and the economy went back to struggling. “In 1936-37, the premature and sharp pace of tightening of policies led to a double-dip in the US economy, resulting in a relapse into recession and deflation in 1938,” said the Morgan Stanley team. This same atmosphere is happening today as the federal government has tapered off its support of the economy and the Federal Reserve is beginning on a path of higher interest rates. This path forward so far, said Ahya, Bartsch, and Ashworth, has shown all of the wobbles of the late 1930s. All is not lost for the people of today, according to the strategists. In fact, there are a few simple policy solutions that can be implemented in order to avoid the mistakes of the past. For one thing, the incredibly easy monetary policy that is currently in place should be boosted by fiscal stimulus. Thankfully, both presidential candidates have advocated for such policies to help push the economy along. “Activating fiscal policy, particularly at a time when the monetary policy stance is still accommodative, could lead to a virtuous cycle where the corporate sector takes up private investment,and sustains job creation and income growth,” said the strategists. In order to make sure that these policies have taken hold, the Morgan Stanley team said that inflation expectations have to recover. Currently, most forward-looking measures of inflation — from the University of Michigan’s household survey to the 5-year, 5-year inflation expectation — are much lower than the Fed’s 2% goal. Even yesterday, Fed Chair Janet Yellen was asked about these perpetually low, and falling expectations, and said she was watching them closely. According to Ahya, Bartsch, and Ashworth, Yellen and the rest of the government have a lot do to to raise them or we could end up repeating a sad part of US economic history.